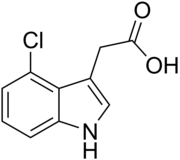 Indole-3-acetic acid (IAA) is the most abundant and the basic auxin natively occurring and functioning in plants. It generates the majority of auxin effects in intact plants, and is the most potent native auxin. There are four more endogenously synthesized auxins in plants. For representatives of synthetic auxins, see: Auxin § Synthetic auxins. Auxins (plural of auxin /ˈɔːksɪn/) are a class of plant hormones (or plant growth regulators) with some morphogen-like characteristics. Auxins have a cardinal role in coordination of many growth and behavioral processes in the plant’s life cycle and are essential for plant body development. Auxins and their role in plant growth were first described by the Dutch biologist Frits Warmolt Went. Kenneth V. Thimann was the first to isolate one of these phytohormones and determine its chemical structure as indole-3-acetic acid (IAA). Went and Thimann co-authored a book on plant hormones, Phytohormones, in 1937. Auxins were the first of the major plant hormones to be discovered. They derive their name from the Greek word αυξειν (auxein – “to grow/increase”). Auxin (namely IAA) is present in all parts of a plant, although in very different concentrations. The concentration in each position is crucial developmental information, so it is subject to tight regulation through both metabolism and transport. The result is the auxin creates “patterns” of auxin concentration maxima and minima in the plant body, which in turn guide further development of respective cells, and ultimately of the plant as a whole. The (dynamic and environment responsive) pattern of auxin distribution within the plant is a key factor for plant growth, its reaction to its environment, and specifically for development of plant organs (such as leaves or flowers). It is achieved through very complex and well coordinated active transport of auxin molecules from cell to cell throughout the plant body — by the so-called polar auxin transport. Thus, a plant can (as a whole) react to external conditions and adjust to them, without requiring a nervous system. Auxins typically act in concert with, or in opposition to, other plant hormones. For example, the ratio of auxin to cytokinin in certain plant tissues determines initiation of root versus shoot buds. On the molecular level, all auxins are compounds with an aromatic ring and a carboxylic acid group. The most important member of the auxin family is indole-3-acetic acid (IAA), which generates the majority of auxin effects in intact plants, and is the most potent native auxin. And as native auxin, its stability is controlled in many ways in plants, from synthesis, through possible conjugation to degradation of its molecules, always according to the requirements of the situation. Five naturally occurring (endogenous) auxins in plants include indole-3-acetic acid, 4-chloroindole-3-acetic acid, phenylacetic acid, indole-3-butyric acid, and indole-3-propionic acid. However, most of the knowledge described so far in auxin biology and as described in the article below, apply basically to IAA; the other three endogenous auxins seems to have rather marginal importance for intact plants in natural environments. Alongside endogenous auxins, scientists and manufacturers have developed many synthetic compounds with auxinic activity. Synthetic auxin analogs include 1-naphthaleneacetic acid, 2,4-dichlorophenoxyacetic acid (2,4-D), and many others. Some synthetic auxins, such as 2,4-D and 2,4,5-trichlorophenoxyacetic acid (2,4,5-T), are used also as herbicides. Broad-leaf plants (dicots), such as dandelions, are much more susceptible to auxins than narrow-leaf plants (monocots) such as grasses and cereal crops, so these synthetic auxins are valuable as synthetic herbicides. In 1881, Charles Darwin and his son Francis performed experiments on coleoptiles, the sheaths enclosing young leaves in germinating grass seedlings. The experiment exposed the coleoptile to light from a unidirectional source, and observed that they bend towards the light. By covering various parts of the coleoptiles with a light-impermeable opaque cap, the Darwins discovered that light is detected by the coleoptile tip, but that bending occurs in the hypocotyl. However the seedlings showed no signs of development towards light if the tip was covered with an opaque cap, or if the tip was removed. The Darwins concluded that the tip of the coleoptile was responsible for sensing light, and proposed that a messenger is transmitted in a downward direction from the tip of the coleoptile, causing it to bend. In 1913, Danish scientist Peter Boysen-Jensen demonstrated that the signal was not transfixed but mobile. He separated the tip from the remainder of the coleoptile by a cube of gelatine which prevented cellular contact, but allowed chemicals to pass through. The seedlings responded normally bending towards the light. However, when the tip was separated by an impermeable substance, there was no curvature of the stem. In 1928, the Dutch botanist Frits Warmolt Went showed that a chemical messenger diffuses from coleoptile tips. Went’s experiment identified how a growth promoting chemical causes a coleoptile to grow towards light. Went cut the tips of the coleoptiles and placed them in the dark, putting a few tips on agar blocks that he predicted would absorb the growth-promoting chemical. On control coleoptiles, he placed a block that lacked the chemical. On others, he placed blocks containing the chemical, either centred on top of the coleoptile to distribute the chemical evenly or offset to increase the concentration on one side. When the growth-promoting chemical was distributed evenly the coleoptile grew straight. If the chemical was distributed unevenly, the coleoptile curved away from the side with the cube, as if growing towards light, even though it was grown in the dark. Went later proposed that the messenger substance is a growth-promoting hormone, which he named auxin, that becomes asymmetrically distributed in the bending region. Went concluded that auxin is at a higher concentration on the shaded side, promoting cell elongation, which results in a coleoptiles bending towards the light. development at all levels in plants, from the cellular level, through organs, and ultimately to the whole plant. When a plant cell comes into contact with auxin, it causes dramatic changes in gene expression, with many genes up- or down-regulated. The precise mechanisms by which this occurs are still an area of active research, but there is now a general consensus on at least two auxin signalling pathways. The most well characterized auxin receptors are the TIR1/ AFB family of F-box proteins. F-box proteins target other proteins for degradation via the ubiquitin degradation pathway. When TIR1/ ABF proteins bind to auxin, the auxin acts as a ‘molecular glue’ that allows these proteins to then bind to their targets (see below). Another auxin-binding protein, APB1 is now often regarded as an auxin receptor (at the apoplast), but it is generally considered to have a much more minor role than the TIR1/ABF signalling pathway, and much less is known about APB1 signalling. The auxin signal cascade: In the absence of auxin, Aux/IAAs bind to and suppress the transcriptional activity of ARFs. When auxin is present it forms a ‘molecular glue’ between TIR1 and Aux/IAAs, which leads to the degradation of these repressors. ARFs are then free to bind to DNA and to cause changes in transcription. Auxin response factors (ARFs) are a large group of transcription factors that act in auxin signalling. In the absence of auxin, ARFs bind to a class of repressors known as Aux/IAAs. Aux/IAAs suppress the ability of ARFs to enhance gene transcription. Additionally, the binding of Aux/IAAs to ARFs brings Aux/IAAs into contact with the promoters of auxin regulated genes. When at these promoters, Aux/IAAs repress the expression of these genes through recruiting other factors to make modifications to the DNA structure. The binding of auxin to TIR1/AFBs allows them to bind to Aux/IAAs. When bound by TIR1/AFBs, Aux/IAAs are marked for degradation. The degradation of Aux/IAAs frees ARF proteins, which are then able to activate or repress genes at whose promoters they are bound. The large number of Aux/IAA and ARF binding pairs possible, and there different distributions between cell types and across developmental age are thought to account for the astonishingly diverse responses that auxin produces. In June 2018 it was demonstrated that plant tissues can respond to auxin in a TIR1-dependent manner extremely quickly (probably too quickly to be explained by changes in gene expression). This has led some scientists to suggest that there is an as yet unidentified TIR1-dependent auxin-signalling pathway that differs from the well-known transcriptional response. On the cellular level, auxin is essential for cell growth, affecting both cell division and cellular expansion. Auxin concentration level, together with other local factors, contributes to cell differentiation and specification of the cell fate. Depending on the specific tissue, auxin may promote axial elongation (as in shoots), lateral expansion (as in root swelling), or isodiametric expansion (as in fruit growth). In some cases (coleoptile growth), auxin-promoted cellular expansion occurs in the absence of cell division. In other cases, auxin-promoted cell division and cell expansion may be closely sequenced within the same tissue (root initiation, fruit growth). In a living plant, auxins and other plant hormones nearly always appear to interact to determine patterns of plant development. Growth and division of plant cells together result in growth of tissue, and specific tissue growth contributes to the development of plant organs. Growth of cells contributes to the plant’s size, unevenly localized growth produces bending, turning and directionalization of organs- for example, stems turning toward light sources (phototropism), roots growing in response to gravity (gravitropism), and other tropisms originated because cells on one side grow faster than the cells on the other side of the organ. So, precise control of auxin distribution between different cells has paramount importance to the resulting form of plant growth and organization. To cause growth in the required domains, auxins must of necessity be active preferentially in them. Local auxin maxima can be formed by active biosynthesis in certain cells of tissues, for example via tryptophan-dependent pathways, but auxins are not synthesized in all cells (even if cells retain the potential ability to do so, only under specific conditions will auxin synthesis be activated in them). For that purpose, auxins have to be not only translocated toward those sites where they are needed, but also they must have an established mechanism to detect those sites. For that purpose, auxins have to be translocated toward those sites where they are needed. Translocation is driven throughout the plant body, primarily from peaks of shoots to peaks of roots (from up to down). For long distances, relocation occurs via the stream of fluid in phloem vessels, but, for short-distance transport, a unique system of coordinated polar transport directly from cell to cell is exploited. This short-distance, active transport exhibits some morphogenetic properties. This process, polar auxin transport, is directional, very strictly regulated, and based in uneven distribution of auxin efflux carriers on the plasma membrane, which send auxins in the proper direction. While PIN-FORMED (PIN) proteins are vital in transporting auxin in a polar manner, the family of AUXIN1/LIKE-AUX1 (AUX/LAX) genes encodes for non-polar auxin influx carriers. The regulation of PIN protein localisation in a cell determines the direction of auxin transport from cell, and concentrated effort of many cells creates peaks of auxin, or auxin maxima (regions having cells with higher auxin – a maximum). Proper and timely auxin maxima within developing roots and shoots are necessary to organise the development of the organ. Surrounding auxin maxima are cells with low auxin troughs, or auxin minima. For example, in the Arabidopsis fruit, auxin minima have been shown to be important for its tissue development. As auxins contribute to organ shaping, they are also fundamentally required for proper development of the plant itself. Without hormonal regulation and organization, plants would be merely proliferating heaps of similar cells. Auxin employment begins in the embryo of the plant, where directional distribution of auxin ushers in subsequent growth and development of primary growth poles, then forms buds of future organs. Next, it helps to coordinate proper development of the arising organs, such as roots, cotyledons and leaves and mediates long distance signals between them, contributing so to the overall architecture of the plant. Throughout the plant’s life, auxin helps the plant maintain the polarity of growth, and actually “recognize” where it has its branches (or any organ) connected. An important principle of plant organization based upon auxin distribution is apical dominance, which means the auxin produced by the apical bud (or growing tip) diffuses (and is transported) downwards and inhibits the development of ulterior lateral bud growth, which would otherwise compete with the apical tip for light and nutrients. Removing the apical tip and its suppressively acting auxin allows the lower dormant lateral buds to develop, and the buds between the leaf stalk and stem produce new shoots which compete to become the lead growth. The process is actually quite complex, because auxin transported downwards from the lead shoot tip has to interact with several other plant hormones (such as strigolactones or cytokinins) in the process on various positions along the growth axis in plant body to achieve this phenomenon. This plant behavior is used in pruning by horticulturists. Finally, the sum of auxin arriving from stems to roots influences the degree of root growth. If shoot tips are removed, the plant does not react just by outgrowth of lateral buds — which are supposed to replace to original lead. It also follows that smaller amount of auxin arriving to the roots results in slower growth of roots and the nutrients are subsequently in higher degree invested in the upper part of the plant, which hence starts to grow faster. A healthy Arabidopsis thaliana plant (left) next to an auxin signal-transduction mutant with a repressed response to auxin. Crown galls are caused by Agrobacterium tumefaciens bacteria; they produce and excrete auxin and cytokinin, which interfere with normal cell division and cause tumors. Auxin participates in phototropism, geotropism, hydrotropism and other developmental changes. The uneven distribution of auxin, due to environmental cues, such as unidirectional light or gravity force, results in uneven plant tissue growth, and generally, auxin governs the form and shape of plant body, direction and strength of growth of all organs, and their mutual interaction. Auxin stimulates cell elongation by stimulating wall-loosening factors, such as elastins, to loosen cell walls. The effect is stronger if gibberellins are also present. Auxin also stimulates cell division if cytokinins are present. When auxin and cytokinin are applied to callus, rooting can be generated if the auxin concentration is higher than cytokinin concentration. Xylem tissues can be generated when the auxin concentration is equal to the cytokinins. Auxin also induces sugar and mineral accumulation at the site of application. Auxin induces the formation and organization of phloem and xylem. When the plant is wounded, the auxin may induce the cell differentiation and regeneration of the vascular tissues. Auxins promote root initiation. Auxin induces both growth of pre-existing roots and adventitious root formation, i.e., branching of the roots. As more native auxin is transported down the stem to the roots, the overall development of the roots is stimulated. If the source of auxin is removed, such as by trimming the tips of stems, the roots are less stimulated accordingly, and growth of stem is supported instead. In horticulture, auxins, especially NAA and IBA, are commonly applied to stimulate root initiation when rooting cuttings of plants. However, high concentrations of auxin inhibit root elongation and instead enhance adventitious root formation. Removal of the root tip can lead to inhibition of secondary root formation. Auxin induces shoot apical dominance; the axillary buds are inhibited by auxin, as a high concentration of auxin directly stimulates ethylene synthesis in axillary buds, causing inhibition of their growth and potentiation of apical dominance. When the apex of the plant is removed, the inhibitory effect is removed and the growth of lateral buds is enhanced. Auxin is sent to the part of the plant facing away from the light, where it promotes cell elongation, thus causing the plant to bend towards the light. Auxin is required for fruit growth and development and delays fruit senescence. When seeds are removed from strawberries, fruit growth is stopped; exogenous auxin stimulates the growth in fruits with seeds removed. For fruit with unfertilized seeds, exogenous auxin results in parthenocarpy (“virgin-fruit” growth). Fruits form abnormal morphologies when auxin transport is disturbed. In Arabidopsis fruits, auxin controls the release of seeds from the fruit (pod). The valve margins are a specialised tissue in pods that regulates when pod will open (dehiscence). Auxin must be removed from the valve margin cells to allow the valve margins to form. This process requires modification of the auxin transporters (PIN proteins). Auxin plays also a minor role in the initiation of flowering and development of reproductive organs. In low concentrations, it can delay the senescence of flowers. A number of plant mutants have been described that affect flowering and have deficiencies in either auxin synthesis or transport. In maize, one example is bif2 barren inflorescence2. In low concentrations, auxin can inhibit ethylene formation and transport of precursor in plants; however, high concentrations can induce the synthesis of ethylene. Therefore, the high concentration can induce femaleness of flowers in some species. Auxin inhibits abscission prior to formation of abscission layer, and thus inhibits senescence of leaves. Auxins are toxic to plants in large concentrations; they are most toxic to dicots and less so to monocots. Because of this property, synthetic auxin herbicides, including 2,4-D and 2,4,5-T, have been developed and used for weed control. However, some exogenously synthesized auxins, especially 1-naphthaleneacetic acid (NAA) and indole-3-butyric acid (IBA), are also commonly applied to stimulate root growth when taking cuttings of plants or for different agricultural purposes such as the prevention of fruit drop in orchards. Used in high doses, auxin stimulates the production of ethylene. Excess ethylene (also native plant hormone) can inhibit elongation growth, cause leaves to fall (abscission), and even kill the plant. Some synthetic auxins, such as 2,4-D and 2,4,5-trichlorophenoxyacetic acid (2,4,5-T) were marketed also as herbicides. Dicots, such as dandelions, are much more susceptible to auxins than monocots, such as grasses and cereal crops. So, these synthetic auxins are valuable as synthetic herbicides. 2,4-D was the first widely used herbicide, and it is still so. 2,4-D was first commercialized by the Sherwin-Williams company, and saw use in the late 1940s. It is easy and inexpensive to manufacture. The defoliant Agent Orange, used extensively by British forces in the Malayan Emergency and American forces in the Vietnam War, was a mix of 2,4-D and 2,4,5-T. The compound 2,4-D is still in use and is thought to be safe, but 2,4,5-T was more or less banned by the U.S. Environmental Protection Agency in 1979. The dioxin TCDD is an unavoidable contaminant produced in the manufacture of 2,4,5-T. As a result of the integral dioxin contamination, 2,4,5-T has been implicated in leukemia, miscarriages, birth defects, liver damage, and other diseases. ^ a b Taiz, L.; Zeiger, E. (1998). Plant Physiology (2nd ed.). Massachusetts: Sinauer Associates. ^ a b c d e f g Friml J (February 2003). “Auxin transport — shaping the plant”. Current Opinion in Plant Biology. 6 (1): 7–12. doi:10.1016/S1369526602000031. PMID 12495745. ^ a b c d e Benková E, Michniewicz M, Sauer M, et al. (November 2003). “Local, efflux-dependent auxin gradients as a common module for plant organ formation”. Cell. 115 (5): 591–602. doi:10.1016/S0092-8674(03)00924-3. PMID 14651850. ^ Hohm, T; Preuten, T; Fankhauser, C (2013). “Phototropism: Translating light into directional growth”. American Journal of Botany. 100 (1): 47–59. doi:10.3732/ajb.1200299. PMID 23152332. ^ a b Whippo, CW; Hangarter, RP (2006). “Phototropism: Bending towards enlightenment”. The Plant Cell. 18 (5): 1110–9. doi:10.1105/tpc.105.039669. PMC 1456868. PMID 16670442. ^ a b Leyser, Ottoline (2018-01-01). “Auxin Signaling”. Plant Physiology. 176 (1): 465–479. doi:10.1104/pp.17.00765. ISSN 0032-0889. PMC 5761761. PMID 28818861. ^ a b c Enders, Tara A.; Strader, Lucia C. (February 2015). “Auxin Activity: Past, present, and Future”. American Journal of Botany. 102 (2): 180–196. doi:10.3732/ajb.1400285. ISSN 0002-9122. PMC 4854432. PMID 25667071. ^ Fendrych, Matyáš; Akhmanova, Maria; Merrin, Jack; Glanc, Matouš; Hagihara, Shinya; Takahashi, Koji; Uchida, Naoyuki; Torii, Keiko U.; Friml, Jiří (2018-06-25). “Rapid and reversible root growth inhibition by TIR1 auxin signalling”. Nature Plants. 4 (7): 453–459. doi:10.1038/s41477-018-0190-1. ISSN 2055-0278. PMC 6104345. PMID 29942048. ^ Mashiguchi, Kiyoshi (2011). “The main auxin biosynthesis pathway in Arabidopsis”. PNAS. 108 (45): 18512–7. doi:10.1073/pnas.1108434108. PMC 3215075. PMID 22025724. ^ Petrásek J, Mravec J, Bouchard R, et al. (May 2006). “PIN proteins perform a rate-limiting function in cellular auxin efflux”. Science. 312 (5775): 914–8. doi:10.1126/science.1123542. PMID 16601150. ^ Swarup, Ranjan; Péret, Benjamin (2012-01-01). “AUX/LAX family of auxin influx carriers—an overview”. Plant Traffic and Transport. 3: 225. doi:10.3389/fpls.2012.00225. PMC 3475149. PMID 23087694. ^ Sabatini S, Beis D, Wolkenfelt H, et al. (November 1999). “An auxin-dependent distal organizer of pattern and polarity in the Arabidopsis root”. Cell. 99 (5): 463–72. doi:10.1016/S0092-8674(00)81535-4. PMID 10589675. ^ Heisler MG, Ohno C, Das P, et al. (November 2005). “Patterns of auxin transport and gene expression during primordium development revealed by live imaging of the Arabidopsis inflorescence meristem”. Curr. Biol. 15 (21): 1899–911. doi:10.1016/j.cub.2005.09.052. PMID 16271866. ^ a b Sorefan K, Girin T, Liljegren SJ, et al. (May 2009). “A regulated auxin minimum is required for seed dispersal in Arabidopsis“. Nature. 459 (7246): 583–6. doi:10.1038/nature07875. PMID 19478783. ^ ALONI, R.; ALONI, E.; LANGHANS, M.; ULLRICH, C. I. (May 2006). “Role of Cytokinin and Auxin in Shaping Root Architecture: Regulating Vascular Differentiation, Lateral Root Initiation, Root Apical Dominance and Root Gravitropism”. Annals of Botany. 97 (5): 883–893. doi:10.1093/aob/mcl027. ISSN 0305-7364. PMC 2803412. PMID 16473866. ^ Chambers (1999). Science and Technology Dictionary. ISBN 978-0-550-14110-1. ^ Nemhauser JL, Feldman LJ, Zambryski PC (September 2000). “Auxin and ETTIN in Arabidopsis gynoecium morphogenesis”. Development. 127 (18): 3877–88. PMID 10952886. ^ McSteen, P; Malcomber, S; Skirpan, A; Lunde, C; Wu, X; Kellogg, E; Hake, S (June 2007). “barren inflorescence2 Encodes a co-ortholog of the PINOID serine/threonine kinase and is required for organogenesis during inflorescence and vegetative development in maize”. Plant Physiology. 144 (2): 1000–11. doi:10.1104/pp.107.098558. PMC 1914211. PMID 17449648. ^ Yu, Y.-B. ; Yang, S. F. (1979). “Auxin-induced Ethylene Production and Its Inhibition by Aminoethyoxyvinylglycine and Cobalt Ion”. Plant Physiology. 64 (6): 1074–1077. doi:10.1104/pp.64.6.1074. PMC 543194. PMID 16661095.